For a species that’s been dead for a century, the passenger pigeon is having a pretty good year. A flurry of new books, features, and a major documentary has been roughly timed to commemorate the death of “Martha,” the last surviving member of the species that drew her final breath in the Cincinnati Zoo on Sept. 1, 1914. It’s a kind of national elegy for a bird that no one alive today remembers ever seeing, certainly not in the wild, where it was last spotted around the time shovels first broke ground on the New York subway system. The bird was a cheap and easily procured source of meat in the 18th and 19th centuries due to its astonishing abundance (once numbering in the billions) and its unfortunate tendency to travel in massive flocks. Its fate was sealed by the 1850s with the expansion of the railroad and telegraph, which fueled an insatiable commercial appetite and profitable pigeon market by providing easy transport and rapid communication about the location of flocks. There were precious few attempts to save the species in that pre–Endangered Species Act era, and none that made a difference. Less than 20 years following Martha’s quiet demise in Cincinnati, the sole surviving heath hen (a close relative of the Greater Prairie-chicken) made its last appearance in southeastern Massachusetts. Nicknamed “Booming Ben” for the bird’s distinctive vocalizations during its extravagant mating ritual, he was a relic of a population that was once common from New England to northern Virginia. Like the passenger pigeon, the heath hen was a plentiful and convenient source of protein (a “poor man’s turkey”) in the 18th and early 19th centuries. By the 1870s, however, the species had been hunted completely off the mainland. Only a few decades later there were fewer than 100 left, all of them hunkered down in a single flock residing in Martha’s Vineyard. Not a bad place to convalesce, unless you’re a small, genetically isolated, nonmigratory bird population. Unlike the passenger pigeon, the heath hen had a few efforts to save it, including banning hunting and creating a sanctuary in the Vineyard in the early 1900s. But the die had been cast. Like Martha before him, Booming Ben—and the heath hen along with him—vanished into the evolutionary ether, mostly likely sometime in the spring of 1932. Although the public was slow to rally to the conservation cause in the early 20th century, not everyone greeted these losses with resignation. One of the strongest voices agitating for wildlife protection during these years was William T. Hornaday, the rabble-rousing wildlife crusader and founding director of the Bronx Zoo. Hornaday challenged the complacency of an American public unwilling to acknowledge the destructive game it was playing with its wild animals. In his conservationist manifesto, Our Vanishing Wildlife (1913), he tried to convey a sense of the biological stakes when a species was pushed to the brink of extinction. It’s doubtful that even in his wildest dreams Hornaday would’ve envisioned that someday scientists and their allies would seriously be contemplating bringing long-extinct species—including the passenger pigeon and the heath hen—back from the dead. Called “de-extinction,” the proposal taps into a range of established and still emerging techniques in cloning and genetic engineering, including the ability to rapidly sequence ancient DNA from preserved tissues of extinct animals to allow scientists to create approximations of lost species by “editing” the genomes of closely related (living) species. 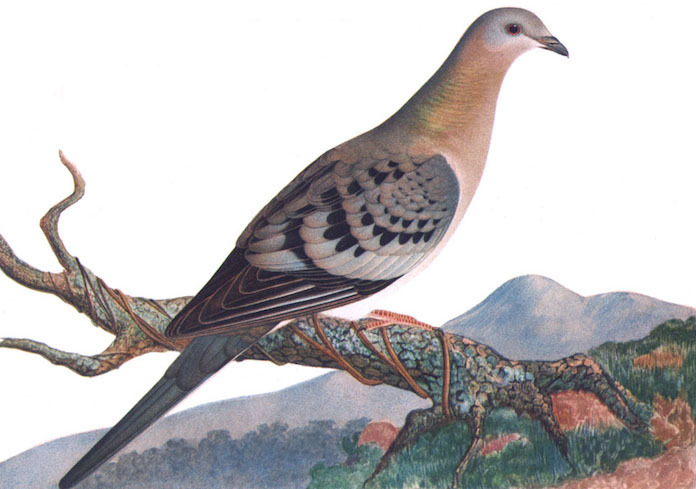 So, for example, the genome of a contemporary band-tailed pigeon could be altered to more closely resemble that of a passenger pigeon, and a population of the new birds could theoretically be bred and released into the wild. The techno-environmentalist Stewart Brand is one of the driving forces behind the idea, which over the past 18 months has drawn considerable media attention and scrutiny. Brand’s Long Now Foundation is supporting scientific efforts to re-create the passenger pigeon—and exploring possibilities for the heath hen—within its “Revive & Restore” project, which has its sights on a range of candidates for resurrection, from the Tasmanian tiger to the woolly mammoth. The de-extinction proposal has been met with no shortage of criticism, ranging from concerns about the misallocation of limited conservation dollars to a “vanity project,” to worries that the newly engineered species will wreak havoc when released into the environment, especially since we may no longer have the space to accommodate them. Fears have been raised that de-extinction will also lead to the relaxation of public commitment to conservation and to averting future species extinctions. I respect Brand’s long and impressive career as a tech-friendly enviro-maverick, but I think he’s wrong about this. De-extinction isn’t really a conservation strategy, and it doesn’t reflect a sound conservation ethic. In fact, I believe pursuing it will seriously undercut an important source of the value we attach to wild species. Even worse, it could undermine the moral lessons of extinction at a critical time in our environmental history. Although a revived passenger pigeon, heath hen, or mammoth (setting aside the question of whether an engineered genome does an extinct species make) may have aesthetic, scientific, and even economic value to society, it obviously won’t share the natural history of the lost species. The evolutionary toil and historical richness of the forerunner species, including their co-evolution with other species over time, has been lost, replaced by a tale of technological manipulations in a 21st-century genetics lab. That doesn’t mean that a novel natural history for the revived forms couldn’t be compiled over the coming centuries. There’s no “rule” specifying how many generations it takes for a species to accrue a distinctive (and hence valuable) natural history, or for one to lose it, as in the case of animals bred in captivity and reintroduced to the wild after an absence (e.g., the California condor). But there’s also no denying that many of the revived “fellow voyagers” would appear long after their unengineered analogues walked the earth or soared in the skies, and without the co-evolutionary narrative that partly defined the natural history of their progenitors. That is, they’ll simply lack the irreplaceable and unique evolutionary character that is part of why we valued the “originals” in the first place—an identity that vanished with them. If they’re fellow travelers, then, they’ll be arriving with suspiciously blank passports. But we can’t reverse the “founding human mistake” by simply bringing back a few, or even a few scores of lost species (as difficult as that would be to pull off). That’s because wiping out the passenger pigeon, the heath hen, the Tasmanian tiger, and so on, as regrettable as these events were, wasn’t the real mistake. It was only the indicator of a deeper moral and cultural malady. No, the foundational mistake was and remains the embrace of a self-regarding worldview in which we see ourselves not as evolutionary “fellow-voyagers” with other species, but as masters of a world thought to be increasingly of our own making. That boisterous anthropocentric ethos is the philosophical engine pulling the train when it comes to extinction and other destructive environmental practices. It’s a belief system that will continue to make mischief even if we’re able to engineer facsimiles of long lost animals. And it will grow even stronger if our technological wizardry gulls us into forgetting the difference between them. The lessons of extinction have therefore never been more critical. We can’t forget them. Although the elegiac narrative in conservation can be depressing at times—a miserable parade of species lost and sacred places ruined—our stubborn refusal to absorb it neither lessens its importance nor challenges its truths about the difficult episodes in our ecological history. And taking stock of this history is, I believe, an important part of our developing an authentic ecological conscience. In discussing de-extinction recently Brand has polished off and revised his infamous motto from his Whole Earth Catalog days: “We are as gods and HAVE to get good at it.” I take his point—it would be foolish to deny our species’ outsize influence and power on the planet. Still, it’s a deeply unsettling notion. The last thing we need to do right now is to spur ourselves to be even more aggressive in taking the planetary reins. Instead, we need to somehow find the will to embrace an ethic of collective self-control and ecological restraint. It’s an attitude that’s especially vital today given our growing recognition that we’re writing our signature deep into the folds of geological history. Resisting the Promethean urge to try to reverse extinction will show that we understand the value of setting some limits on our meddling in nature even as we inevitably expand our planetary reach. It will hopefully also remind us that some of the most elevating applications of human power are not found in displays of technological mastery, invention, and ecological control. They reside instead in acts of self-possession, including the drawing of lines in nature that we do not cross, even if we can. Or to put it all this more simply—and in the words of a (still living) species of beetle [sic]: Let it be. "Extinct Species Should Stay Extinct" is cross-posted with Slate. Earlier this year, Slate published an adaptation of Brand’s Issues in Science and Technology review of Cloning Wild Life, which conveys some of his thinking on the use of “high-tech genetic rescue” of both currently endangered and recently extinct species. The use of ancient DNA—as would be the case with the passenger pigeon, the heath hen, and the Tasmanian tiger—employs even more ambitious techniques in genetic engineering than somatic cell nuclear transfer. Image credit: Female Passenger Pigeon by Cotinis courtesy of Flickr. Ben A. Minteer holds the Arizona Zoological Society Endowed Chair in the School of Life Sciences at Arizona State University. His work explores the intersection of environmental ethics, ecology, and conservation, especially the impact of global environmental change on our understandings of environmental responsibility.